What crafts or craft supplies should I sell? Where can I find wholesale craft supplies? Where can I sell crafts and craft supplies? #1: For creative people: Create items to sell from bulk wholesale craft materials. If you get this right, you can make a lot of money doing something you love. Consider Alicia, who makes almost a million dollars a year from craft headbands and clothing items. She’s had to recruit 15 other moms to help her craft her goods because her customer base is so large! Then there’s Kate, who gave up an unfulfilling job to sell homemade knick-knacks, including cards, nail stickers, prints, buttons and badges. Money certainly isn’t the only perk; one mother discovered that a craft business helped her to improve her mental health and find a community to belong to. So there’s potential here for crafty individuals, but what about the less creatively inclined? There’s just as much profit in this, if not more. This post on top Etsy sellers from some time ago shows a bead supplier, Yadanabeads, at the top of the list. Several years later, on another Etsy top sellers list, it’s still there. And on this later list, the number one place was also taken by a supplier of charms and other small items. There’s a trend here: Craft supplies have a lot of potential to sell well, and in an ongoing way. This is not a fleeting market that could disappear at any minute. There’s a huge market for crafted jewelry and wearable items, as well as jewelry-making supplies. And you’ve got options: Make your own crafts, sell craft supplies, or even a combination of the two (i.e., buy wholesale supplies, and then add features or embellishments). All of these paths can be successful. What crafts or materials should I sell? Tip #1: Find your niche. If you sell a broad range of every craft supply under the sun, it’s much harder to target a buyer audience. When people want beads, they go to Yadanabeads because the store specializes in beads. It doesn’t matter if you’re crafting or selling supplies; decide on a specific type of product and focus on that. Get to know your future buyers and understand what they want, then put some time and effort into finding or producing a quality product to meet their needs. To ensure the success of your craft business, you need to keep an eye on what types of products are selling well. You can see which sellers are doing the best, and you can look at what products are selling most. To see which sellers are having the most success, check out the daily top sellers on Etsy. You can look specifically at sellers that stock either handmade items or supplies. Look at their stores on Etsy; what types of products do they sell? How do they display and list their items? Think carefully about how you can use these examples for inspiration. 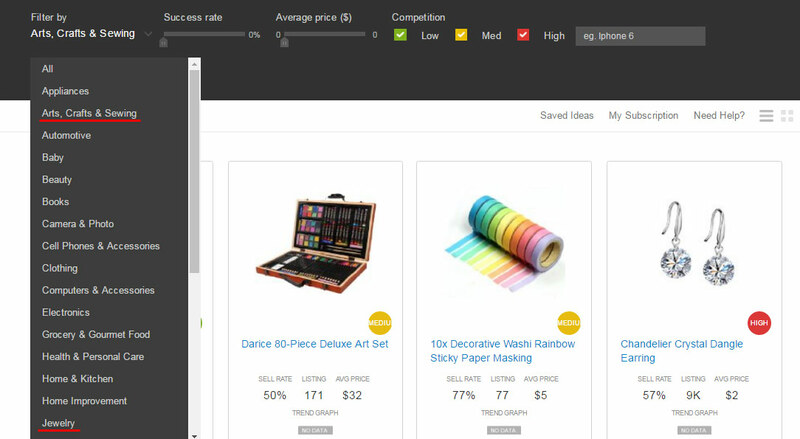 To see which specific products are selling best, use a tool like the SaleHoo Labs. There’s a category for looking at arts, crafts and sewing supplies, plus a jewelry category that you can look at for inspiration. The lab shows you the top-selling products in these categories on eBay and Amazon at any given time. Are there trends in types of products that people are buying? Popular colors or styles? Keep an eye on trends like these to keep up with your market. One good way to market your items is to create bundles of things people buy together. These can making shopping quick and easy for buyers, you can sell more than one item at once, and it can help you to stand out from other sellers offering the same types of supplies individually. If you’ve got craft supply bundles, show pictures of the kinds of things people could create with them. If you’ve got jewelry or accessory bundles, show them modeled together. Where can I find craft supplies? Finding trustworthy suppliers is no easy feat. There are a lot of scams and low-quality products out there. We’ll cover the 3 main types of sources for finding stock, then we’ll go on to the list of suppliers. You buy bulk cheap craft supplies, the supplier sends them to you; then, you store them and decide where they go from there. It's one of the cheapest ways to get craft supplies. You see the stock for yourself and can do quality control. You manage how items are packaged and delivered. You can make your own crafts or bundles. You have to have somewhere to store the stock. It’s more time, responsibility and effort to manage it yourself. Sometimes you have to buy in larger amounts than you’d like. If you can’t sell them, you could get stuck with a lot of craft supplies! Ask for samples before you buy large quantities. If they have minimum order sizes that are huge, ask if they’re prepared to go smaller. If they don’t accept these methods, don’t risk it; find another supplier. If you don’t have one already, you can easily set one up. You make listings of craft supplies that your dropshipper stocks. When you make a sale, you pay the dropshipper for the items, put in the customer’s address, and the dropshipper packages and sends the craft supplies for you. You don’t have to handle stock. It’s quicker and easier for you. You haven’t lost money or landed yourself with a house full of items if you can’t sell something. You won’t get as good a price as you would buying bulk. Smaller profit margins on each item. You have no control over how the products are packaged or sent. Sometimes dropshippers can run out of stock suddenly and leave you in the lurch. Keep up with the availability of items you’re listing — watch out for low stock! Check the progress of orders you’ve made. You don’t want to be the last to know if the order has been overlooked. You can find extra dropshipping tips here. Similar to wholesale buying, but the stock you’re getting is being sold off at super low prices. This can happen for a variety reasons, such as a store having surplus stock or a company that’s closing down dumping its remaining stock. This is usually the cheapest option for buying craft supplies. Unlike other types of liquidated products, if craft supplies don’t sell well, you have the option of making them into crafts to sell instead. Sometimes supplies are being liquidated because they don’t sell well, or they’re faulty somehow. There may not be liquidated stock of the types of items you want. You often have to buy a large mix of items and then sort through them. Get a full inventory of what you’re buying in advance. Look around at the market: Do people actually want these supplies or the items you could make out of them? So those are your sourcing options. Now it’s time to look at your supplier options. Where can I get wholesale jewelry and craft supplies from China? This wholsale supplier has an incredibly extensive range of craft supplies. This supplier also has a large range of craft supplies, and the company offers dropshipping as well as wholesale. This wholesale supplier specializes in jewelry-making supplies, with a range of fantasy and themed jewelry supplies. Where can I buy bulk craft supplies and scrapbooking supplies? This supplier offers both wholesale and closeout craft and scrapbooking supplies. This supplier has wholesale and closeout goods, and also offers dropshipping. They stock high-quality, low-cost craft and scrapbooking supplies. This supplier stocks all things ribbon! All colors, materials, widths, patterns, even ribbons for different occasions. You can also purchase gift tags, lace ribbons, trims and embellishments, banners and garlands. The company offers wholesale and dropship services. This wholesale supplier has basic craft supplies and kids craft materials, as well as supplies for making dolls and candles. The company also offers a nice range of artificial floral items. This wholesale supplier carries a broad range of craft supplies, such as beads, crystals, buttons, studs, stickers and more. This closeout supplier has very low-cost craft and scrapbooking supplies. Where can I buy bulk jewelry supplies? This supplier offers a huge range of wholesale and closeout jewelry supplies. This supplier also offers closeout and wholesale jewelry supplies, from beads, charms and pendants to findings, wire and cord. The company also stocks jewelry-making tools, adhesives and accessories. This wholesale supplier has an absolutely massive range of just about every type of jewelry supply you could think of. Where can I buy wholesale paint and art supplies? This supplier offers quality wholesale art supplies, as well as closeout stock. This supplier offers closeout, wholesale and dropship services for art supplies. You'll find an incredibly extensive range with thousands of low-cost products. This wholesale supplier has a range of painting materials, including acrylic paint, brushes and accessories, mediums and finishes, stencils, and gallery glass window paint. This supplier offers wholesale seasonal craft supplies. This wholesale ribbon supplier offers seasonal ribbon varieties, and also offers a dropshipping option. These are only a few of the trustworthy wholesale suppliers of arts and craft materials in the SaleHoo directory. Where can I sell craft supplies? There are a few different options when it comes to selling your crafts or craft supplies. Let’s look at the pros and cons of each. Etsy is the main online marketplace for selling handmade items and craft supplies. Large marketplace with a craft-craving customer base. Low fees, lower than other marketplaces such as eBay. It’s quick and easy to start selling. You have to compete with other sellers and it can be hard to stand out. Make use of Etsy’s seller handbook. Check through Etsy’s seller policy to learn what you can and can’t do. If you plan on selling in the handmade items category, read these guidelines in particular. When listing your products, use simple terms that people will use when searching. Getting too creative can make it hard for people to find your products. Fill in any information you can about your Etsy store and your products; a full profile of information helps. Prioritize good customer service to grow your business through word of mouth. eBay and other marketplaces have similar pros and cons to Etsy; however, they’re not specific to crafts and crafty buyers, and they have higher fees. This is a dream for many, and it’s not so far out of reach as you might think. Sometimes sellers like Alicia start selling on a site like Etsy, and when they’ve built a customer base, they move to their own store. You can build your own brand. You don’t have to compete with other sellers. You can set things up exactly as you like. You have to build your own site. You have to build a customer base for your store. If you’re concerned about technical skills, use a product like SaleHoo Stores to make it easy to build your own online store. Use the marketing tips below to build your customer base. One selling option that works especially well with crafts is craft fairs, local markets, and pop-up shops. Search for markets in your area that you might be able to sell your goods at. Potential customers can see your products for themselves before they buy. You can talk to buyers and sell your goods directly. You can meet other crafters and spend an enjoyable day out. It takes personal time and effort. If you’re not a people person, a day of interacting with people may be tiring. You can’t reach as many people as you can online. It can cost more than it’s worth to set up a booth at a craft fair if you don’t have the right goods. Visit a few markets and fairs to get an idea of what works from a customer perspective. Weigh the costs involved against the potential for profit. Plan a pleasing layout for your goods before you go. Build a loyal local customer base by being friendly and a pleasure to do business with. Don’t forget to take food and water with you to the show! The tips below are the most commonly mentioned strategies from the success stories at the beginning of this post, and they’re some of the best ways to market yourself in this niche. Many sellers get a lot of exposure to potential buyers on social media sites such as Instagram, especially with such a visual niche as crafts. Get the best pictures of your products as you can. Show wearable items being worn. Show neat ideas for what people could do with your craft supplies. Then add a description that hashtags any words or phrases that describe the product. Rinse and repeat on Pinterest. You can also set up pages and groups on Facebook where you can post about your goods as you make them, or let people know when you get supplies in. Craft community groups: Good for asking about and supplying what crafters want. Jewlery pages: Common buyer-audience on social media sites. Wedding- or baby-themed pages (showcase invitations, table decorations, baby clothes etc… or supplies to make their own). Sometimes giveaways work well for getting people to share pictures of your products or your page. This is where that customer satisfaction is so important. Building a strong relationship with customers not only makes it more likely that they’ll come back, it also means they might recommend your store to their friends. One way to generate some online word of mouth is to get mentioned on blogs and media pages. Look up websites that revolve around the niche topic of your products, or sites with a similar audience, and ask if they would feature you. You can offer a guest post, or you could offer them some free products and see if they won’t write about them. You can also approach YouTube personalities or people with relevant social media followers. Finally, when people do buy your products, thank them and ask them to tell their friends about your store. Not all of them will, of course, but it doesn’t hurt and sometimes people will. Buy cheap wholesale craft supplies to make and sell your own crafts. Sell wholesale craft supplies to sell for profit. There’s a broad range of craft supplies you could sell, so it’s important to refine your niche and specialize in a particular type of craft or craft supplies. You can sell crafts and craft supplies on Etsy, other marketplaces such as eBay and Amazon, your own online store, or at local markets and craft fairs. To market your craft supplies, post on Instagram as well as Pinterest and Facebook, and use good customer service and word of mouth to build a loyal customer base. If you’re looking for any craft supplies that you haven’t seen here, request suppliers in the “Supplier Wanted” section of the SaleHoo forum, and we’ll hunt down a supplier for you. I stumbled across this site and I am intrigued. I am interested in learning so much more. I want to start a business and I am eager to start. I am a very crafty person and I love making things and learning new things.